Mike and Janet are constantly amazed as traditionally trained nurses how profoundly beneficial Reiki & Sound Healing Treatments can be. Janet started her training after reading “Hands of Light” by Barbara Ann Brennan, 20 years ago, following the lineage of Dr Mikao Usui, Mrs Hawaya Takata and Phyllis Lee Furomoto. Training for Reiki One with Fiona Shaw in Brighton 1993, Reiki Two with Sue McCarthy in Wales 1998, and finally Reiki Master Certification with Doris Ritchie in Sussex 2002, (all dedicated and powerful hands on healers). Fully clothed therapy treatments take about one to one and a half hours from start to finish, in the case of severe fatigue/burn out, it is recommended to have a series of 5 daily sessions, followed by one a month. Especially beneficial for those recovering from illness and those living with Cancer. Many clients enjoy a treatment once every 3 months, to maintain optimum health, and top up their energy levels. Reiki often translated as Universal Healing, involves the practitioner opening as a vessel, for the client to receive the healing energies, with emphasis on unblocking the physic centres known as the Chakras, these energy vortexes are responsible for the efficient working of glands/organs within the body. Blockages are created by stress/tension; a session in the therapy room ensures the client releases tension whilst relaxing in a safe and quiet environment. Reiki energy flows to wherever it is needed in the body, removing energy blocks that may be preventing good health and wellbeing. Feedback is often expressed “as having a nice warm cuddle all over”, we offer you time to rest and recuperate. 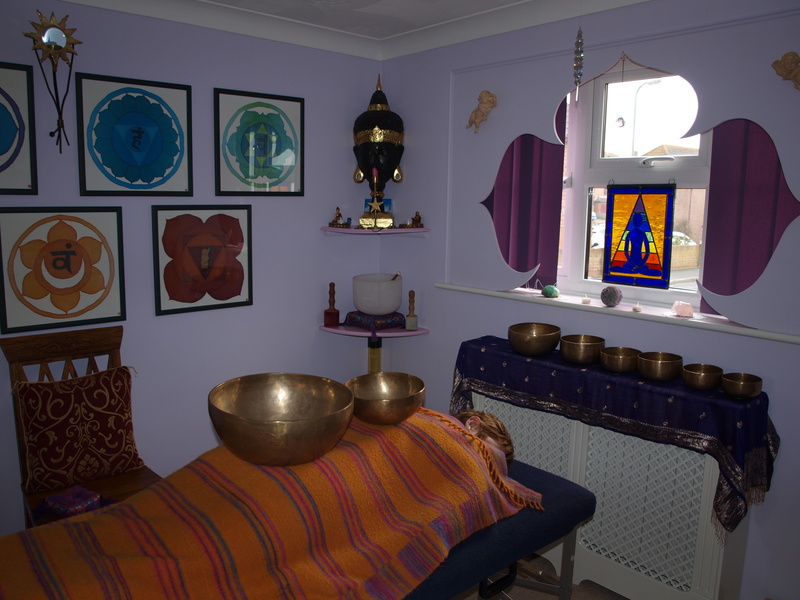 Reiki and Sound Healing Therapy Sessions by appointment : £35 per hour or £40 with 2 therapists in attendance (all profits go to Cancer Research). Reiki Atunement (Certificated Therapist Training) available on request.